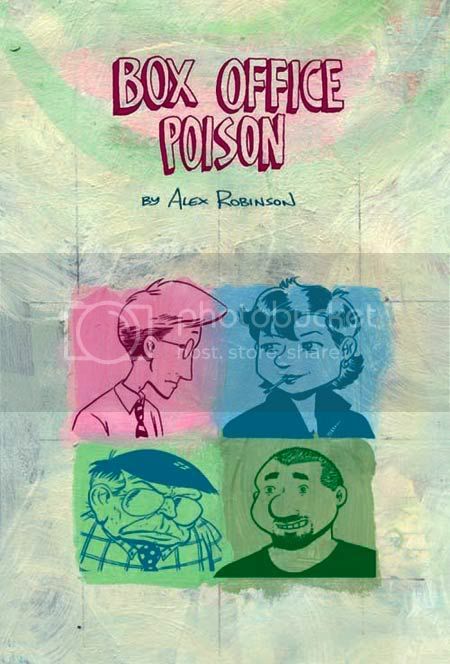 Alex Robinson worked in a big-city bookstore for seven years after graduating from high school in 1987. After reading his first graphic novel, “Box Office Poison,” it’s very clear that he didn’t enjoy the job. 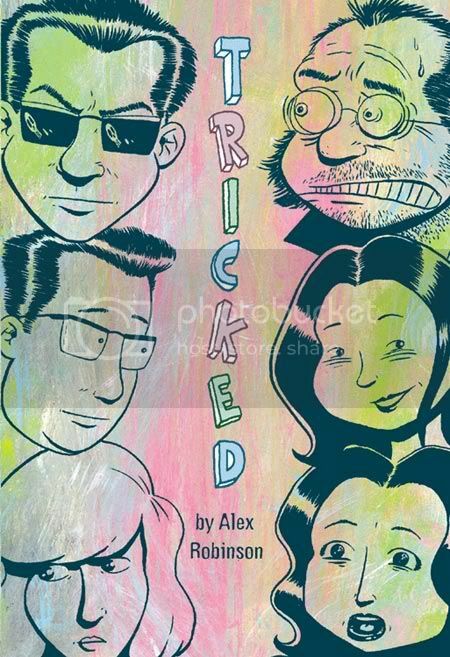 Now, Robinson is the creator of two highly regarded comics (“Tricked,” his second effort, is available now) that are sold in bookstores like the one he used to work at. While “Box Office Poison” (BOP, for abbreviation’s sake) is a story of pretty average folks struggling through the daily grind in New York, “Tricked” is a pseudo retelling of the John Lennon story. Both intricately weave together the lives of several people. Robinson’s black and white art that’s more reminiscent of newspaper cartoon strips than the latest issue of X-Men pulls readers into an intimate relationship with the characters. I had a chance to e-mail some questions to Alex recently, and below is the transcript. Me – I just finished Tricked. I’ve read some reviews and interviews with you, and it seems like some people were disappointed by it. I liked it. It’s a completely different kind of story from BOP, and I imagine that threw a lot of readers off. Did you know, going into the project, that you might disappoint people looking for more of the same? Alex Robinson – Huh, I didn’t know that a lot of people were disappointed. I don’t read reviews so my only impression about how the book is received is from e-mail and when I go to shows, so I guess people are too polite to say anything. I did get one e-mail from someone who didn’t like the book. But yeah, BOX OFFICE POISON did pretty well so it’s only natural that some people are going to be disappointed, especially since I wasn’t doing a sequel to the first book. It’s a compliment, in a way, because it means they liked the first book so much, but of course you want everyone to like your stuff. I’m actually shocked TRICKED has done as well as it has! One of the working titles for the book was SOPHOMORE SLUMP so part of me really expected the audience to be disappointed, but I’m a pessimist by nature. I’ve started working on an idea for a new book and I’m already preparing myself for it to be despised and unpopular. Me – The plot of Tricked had a lot of influence, it seemed, from John Lennon’s murder. Was that a subject you’d been interested in? It came to me partway through reading that in BOP, Sherman’s stories were often on the Beatles. Tricked almost seemed like something Sherman might have written. In one early verison of the story, the assassin was played by me–that is, he looked like me. It was my way of sort of confessing that I was engaged in character assassination. Yes, very clever. Me – BOP didn’t have an extremely obvious central theme, but it did (as I interpreted it) share with Tricked the idea that people get what’s coming to them. “The love you take is equal to the love you make”? – sorry, had to throw another Beatles reference in there. What do you think were the “big ideas” that influenced the stories? AR – For me the theme of BOX OFFICE POISON had to do with making difficult choices. Both Ed and Sherman are in unhealthy relationships, but they both handle them in different ways. So in a way you’re right, that you could see it as them getting what they deserve, but do you really think Sherman deserved to wind up trapped in an unhappy relationship? A friend of mine pointed out that what makes Sherman’s story so sad is that he seems to make all the right decisions but somehow winds up miserable. I guess, to paraphrase Jerri Blank, he was making the right decisions for all the wrong reasons. Me – I’ll admit that I did like BOP more than Tricked. I say that as a compliment to BOP, more than an insult to Tricked. In BOP, there were these extremely subtle plots in the story that I didn’t notice until it all came together. The big example of this is the way that some very ugly characters are subtly built up, and then an emotional punch comes along that turns them from demon to human. The two that struck me the most were the landlady and Hildy’s little sister. Is that something you’re conscious of, trying to make all the characters relatable? AR – That is something I like to examine. One of the things I thought was interesting was that, when BOX OFFICE POISON was serialized, everyone said they either loved to hate Dorothy or just plain hated her. Maybe it’s just the way people are conditioned, that there has to be a bad guy in the story, but I never really saw her as a bad guy. She had her problems, as we all do but I don’t think she’s genuinely bad. The only two real one dimensional villains in the book I can think of offhand are LeBlanc, the publisher of Zoom Comics (though I could’ve easily told the story from his point of view and made him more sympathetic–but somebody has to be the bad guy!–and Mako, who murders someone in cold blood. I generally try to find the humanity in all the characters. When you spend so long on a graphic novel, thinking about it for years on end, you almost can’t help but give characters depth and backstories of their own. Me – Another of the interesting twists of BOP was how the main character slowly shifted from being Sherman to Ed. Was that the intent all along? AR – No, not really. I never script out or tightly plot my stories out, so I like to leave myself a lot of room to play around. I know how the story will end and what things have to happen before then but beyond that I like to be very flexible and sort of let the characters guide what happens. That sounds very writerly and pretentious but it’s true for me. By the end of the book, I found Ed to be really blossoming and Sherman was on the decline, to the point where I was nearly disgusted with him, so if I wanted to book to not be a total downer I couldn’t end it with Sherman Throughout the book, different characters sort of narrate the action (Stephen in the Christmas story, Jane when she’s telling us how she and Stephen met, etc) so it didn’t seem too outrageous to have another character take over. Some people didn’t like it, though. They thought it was unsatisfying. Me – With Tricked, since you knew you were doing something pretty different, did you ever consider going in a different direction with the art as well? AR – I actually switched to these Japanese pen brush things for TRICKED, but other than that I never thought about making a dramatic change in my art. I’m okay for what I do, but I’m not a versatile chamelon-like artist who can change styles easily. Me – On the topic of art, when I read your books my first impression was that your style has the most similarities to newspaper comic strips and some of the stuff in Mad Magazine. Who, if anyone, do you think yourself to be similar to? AR – I did enjoy MAD as a kid and the first comics I read were newspaper strips, and ARCHIE. The single biggest artistic influence I can think of is Dave Sim and his work on CEREBUS. I started reading his stuff when I was fifteen or so and it had a huge impact on not just my storytelling and art but on my attitudes about comics and the industry. Me – Now the easier questions: Who are the artists/writers out there now that you make a point of checking out? AR – There are the usual stars, of course, like Chris Ware, Chester Brown, Crumb, etc. On the less well known side is Tony Consiglio, who isn’t nearly as productive as he should be but he finally has a graphic novel coming out this spring called 110PERCENT which is terrific. Another guy you’ll be hearing big things from is Mike Dawson. He’s currently working on a big autobiography called FREDDIE & ME which will I think will put him on the map. 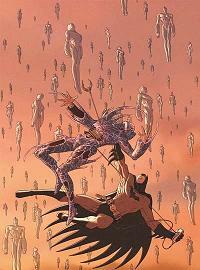 I also enjoy Tim Krieder’s weekly comic THE PAIN:WHEN WILL IT END? Me – What projects are you working on now? AR – I’ve just started working on a story that I hope will turn out to be my next graphic novel. I say “hope” because there’s always a chance it could fizzle out, so I don’t want to say too much about it. I will say that it will probably be shorter than my two other novels and I’d like to have it out for summer 2007. Keep my fingers crossed! Me – Top Shelf seems to be a good fit for you. How much have you enjoyed working with them? AR – It’s been pretty nice. One of the big appeals of Top Shelf was that they said they were really going to make an effort to penetrate the bookstore market. That was a big incentive to give them a shot and I’m happy with the results so far. Me – Ultimately, what do you want your readers to get out of your work? AR – Obviously on the most basic level I hope they find it entertaining or interesting at least. Beyond that, it gets harder to say. Kurt Vonnegut once talked about something like this and he said part of the reason he wrote was sort of a way to offer comfort to his readers. The world was a screwed up place and sometimes awful things happen but the good news is that you’re not alone. You hope that someone will read your book and think to themselves “There’s someone out there who sees the world the same way I do” and take some comfort in that. I guess that’s as close as I’ve gotten to a good justification for what I do. It’s like Shakespeare, but with lots more punching. For those who missed out, that comes from the bizarre theme song to the latest Warren Ellis creation for Marvel, “Next Wave.” (To check out the song, go to www.marvel.com/nextwave/) The first issue came out Wednesday and was easily the most exciting launch of the week. In a nutshell, it’s decent. Not great, not horrible. Decent. The characters are an ensemble of also-rans: Monica Rambeau (Captain Marvel and Photon), Aaron Stack (Machine Man), Tabitha Smith (X-Forceâ€™s Meltdown), monster hunter Elsa Bloodstone and Captain @#%&@#$ (or something like that). A diapered Fin Fang Foom makes an appearance as well. The plot is that a secret terrorist organization is trying to unleash Fin Fang Foom on the world, and the Next Wavers step in to put a halt to the mayhem. Oh, and Fin Fang Foom is buried in South Dakota before he’s unleashed, for some reason. Don’t expect implications anywhere else in the Marvel U. The characters don’t matter and the plot points are almost entirely new. 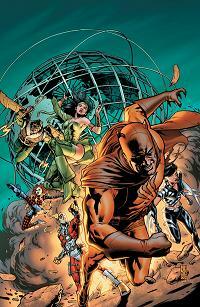 It’s similar to Howard Chaykin’s 2004 limited series “Challengers of the Unknown” in that respect. The two series also share a “hit me over the head with a shovel” attempt at political commentary (Though Next Wave isn’t as bad, it still may as well have a “Republicans = bad” sticker on the cover). So yeah, I was wrong. 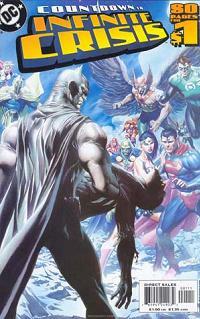 Darkseid isn’t behind Infinite Crisis. It’s not a plan he and Lex Luthor started way back in Superman/Batman: Public Enemies to eliminate Earth’s metahumans so they could take over earth and the rest of the universe without opposition. Supergirl didn’t kill Martian Manhunter (although I’m still convinced she’s evil). But you know what? I couldn’t be happier I was wrong. 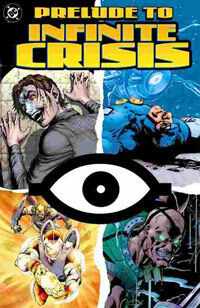 Infinite Crisis #4 came out this week, and with it came an amazing explanation of the big four events leading up to Infinite Crisis. The rampage of the Spectre in Day of Vengeance was of the utmost importance, as all of the world’s magic was reduced to it’s rawest form, creating the fuel necessary for Alex Luthor’s machine. On the other hand, the Rann/Thanagar War was merely a side effect of Superboy repositioning the planets to the way they were before the pre-Crisis Earths merged. The creation of the Society in Villains United was just a means to attain the ingredients necessary to run the machine: representatives from each of the pre-Crisis Earths. 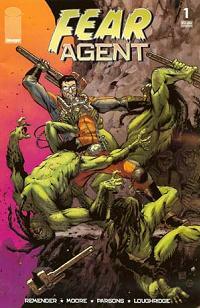 And the OMAC Project was…the programming? I’m not quite sure why a mystically powered, universe altering machine needs programming from a sentient computer, but if nothing else, it was a big red herring that kept the heroes’ attention pointed elsewhere while Luthor was able to put his plan into motion. And all that exposition only took up one page! That left 29 pages for the destruction of Bludhaven; a meeting between Batman and Nightwing (continued directly from the last panel of the issue of Nightwing that came out this week) that drastically improved Nightwing’s standing in the DCU (poor, doomed Nightwing); the continued mysterious mission of Booster Gold and Skeets, the most unfortunately named robot sidekick ever; the Spectre receiving a new host (a character from, of all books, Gotham Central); a huge knock-down, drag-out fight between Earth-Prime Superboy and the combined forces of the Teen Titans, Doom Patrol, the JSA and more, featuring dismemberment, decapitation and chest explosions; the end of the Speed Force and two Flashes; the (momentary) return of Barry Allen; Alex Luthor ripping a hole in the fabric of time and space; and the restoration of Earth-2. Sure, I could nitpick the tiny things, like how Nightwing was inside Bludhaven, not on its outskirts, when he met up with Batman in Nightwing, or that the Amazonian super-weapon shown in Infinite Crisis #3 doesn’t look anything like the one shown in Wonder Woman. But at least every character acts consistently the same in all of their appearances and things that relate to crossover titles are being addressed in them. Joe Quesada take note: THIS IS HOW YOU DO A MEGA-CROSSOVER! Only halfway in and we’ve already seen more happen than what happened in House of M and The Other combined. 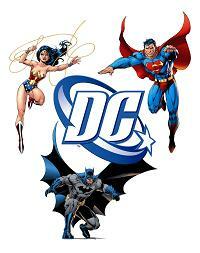 Thank you, Geoff Johns and DC, for making all this actually mean something. 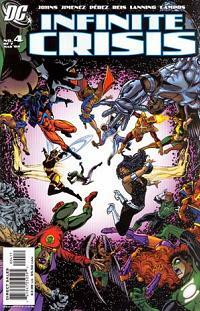 Tie between The Question and Astro City: The Dark Age. When I read some comics that have some sort of scientific or mystical element to them, I commonly get the vibe that the author just read some scientific journal article or something and thought “Oooh, I’ll work that into a story.” I’m thinking of pretty much every Warren Ellis book I’ve ever read. I’m not saying that’s Mr. Ellis’ process, because I really have no idea. But I am saying that when I read his books that have some sort of underlying sci-fi scheme, it seems like the story exists to legitimize the scientific idea, and I don’t usually think that makes for a good story. With The Question, a scientific / mystical undercurrent drove the whole book, but in this case, it served the story and gave it purpose, rather than the other way around. I also loved the tiny details along the way, such as using restrooms for evildoing since that’s the one place Superman wouldn’t use his x-ray vision. 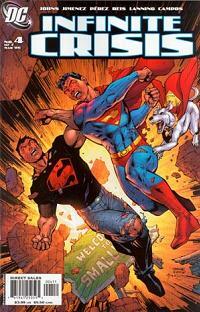 It created a completely believable scenario in which a 6-issue miniseries could happen in Superman’s city under Superman’s nose. As far as Astro City: The Dark Age goes, there’s just such a level of gritty realism to that book that is simply breathtaking. Also perhaps treasured because of so many who fail trying to do the same thing, the “realism” here isn’t done through shock value or darkness – it’s through well-defined characters going through well-defined, yet differing, life paths. Told through the perspective of two brothers, these four issues manage to tell an inspirational heroic story the way you could really see it unfolding.